Sit in your kayak looking forward. Your effective forward stroke should be within your field of vision with the blade exiting within your peripheral vision. 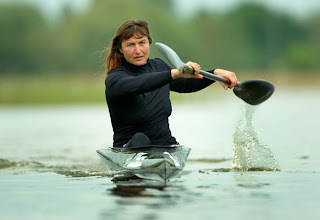 When you're moving forward, most of your steering and correction strokes, everything you need to maintain a straight course, can be done outside your peripheral vision if you're looking straight ahead because your most effective corrective strokes address the stern of your kayak. When you make adjustments to your direction, turn your torso toward your blade. If your head is aligned with your torso, you should be able to see your blade at the stern when you make course corrections.